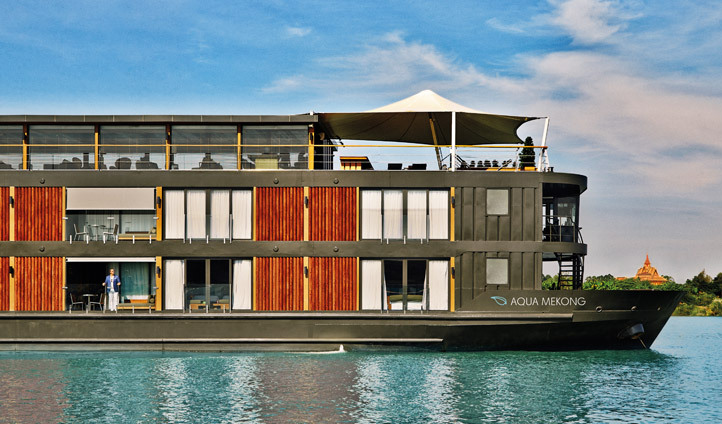 The Aqua Mekong Cruise is the ultimate river safari. As the first 5-star luxury cruise ship to travel up and down between the Mekong River in Cambodia and the Mekong Delta in Vietnam, this unique cruise offers a rare opportunity for guests to explore the full history and diverse cultures of Mekong life. There are 20 suites on board the ship, accommodating a maximum of 40 guests. Guests can choose to embark on a 3, 4 or 7-night itinerary, all of which include exciting excursions to local villages, floating markets and ancient Buddhist monasteries led by experienced river guides. 10 complimentary bicycles are also provided for passengers wanting to explore the picturesque banks of the Mekong River on their own. The adventure isn’t just off the boat though and on board, Michelin starred chef, David Thompson, uses local flavours and fresh ingredients to create an ever-changing menu of delicious Mekong-inspired recipes. The Aqua Mekong cruise ship travels up and down the Mekong River between Cambodia and Vietnam, as such, start and end points change depending on whether you’re going up or down the river and whether you’re doing the 3, 4 or 7-night itinerary. In Vietnam, the embarkation point is in Ho Chi Minh City and in Cambodia, embarkation points are in both Phnom Penh and Siem Reap. All three cities have international airports close by. The ship has 20 spacious design suites, 10 on the first deck and 10 on the second deck. All of the rooms come with ensuite bathrooms, air conditioning and floor-to-ceiling windows for stunning views along the Mekong river. On each deck 4 of the 10 rooms have balconies, with sliding doors and an outdoor daybed, whilst the rooms without balconies all have huge floor to ceiling windows that look out over the river. All of the suites are created using local materials and offer all the contemporary comforts of a 5-star hotel. No trip along the Mekong River would be complete without a relaxing South East Asian massage. The onboard spa offers a full range of holistic, restorative and energizing treatments from Khmer massage to Vietnamese aromatherapy. 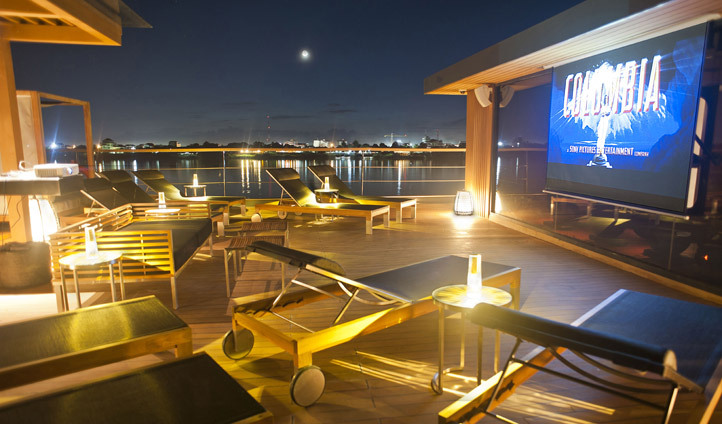 On the top level, the Observation Deck has been designed so that the river always remains in full view and with two bars, a plunge pool and comfortable sun loungers, guests can enjoy the vibrant river life in utmost comfort. We love the outdoor cinema which shows classical films about the area for a relaxed evening under the stars.